Coach Dominic Rice brings a wide range of playing and coaching experience to the Spartan Boys Soccer program. As a player Coach Rice played professional and semi professional soccer in England for several years including Sunderland AFC and Lincoln City FC. A graduate of Sunderland University, he studied sports and exercise development. Now as part of The Football Club USA, he is the Director of Coaching and has been the Varsity Coach of the Immaculata Boys team since 2009. 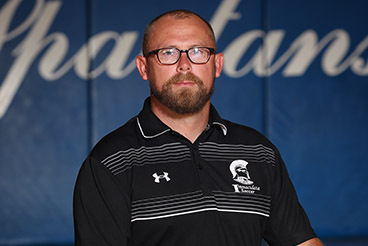 Among his proudest moments with the Spartans were being the first Varsity coach to win a State game in IHS history, reaching the state sectional semi finals in 2014 and state sectional final in 2017. Coach Rice works to teach his players the skills and tactics needed to be competitive and successful. But just as important, he feels, is to enjoy the game and learn some key life skills, such as teamwork, full commitment, leadership, and the importance of a good attitude.